Our exhibitors offer career resources and jobs. Companies were accepting resumes for more than 100 jobs. What’s your eco career goal? What do you need to do to get there? What do you need to learn? How do you gain the experience required? Environmental sustainability and economic goals are challenges many strive to meet. Learn about exceptional research and solutions underway. What does our new energy legislation mean for future jobs? 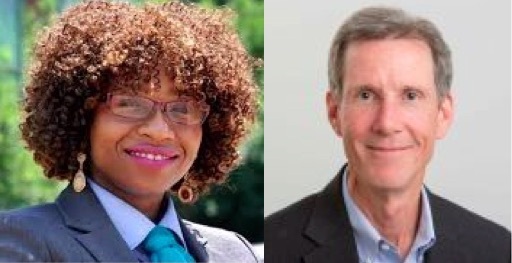 What’s happening with our green budget and jobs at the state level? Get your answers here. Environmental programs and resources are developing the next generation of students and schools. Learn more about Green Schools. Hear from professionals dedicated to careers and lifestyles that help us live more lightly on the planet. Ecological restoration, sustainable landscape planning and design, and similar fields offer nature-based careers in environmental stewardship that benefit you and our communities. Hear from experts working for walkable, bikeable, livable, vibrant, downtown communities that we all can enjoy. If our future is going to be more sustainable, we need planners, landscapers, clean energy experts, and all professions to work for sustainable solutions in our communities. New this year! Industry association reps describe employer and employee resources. 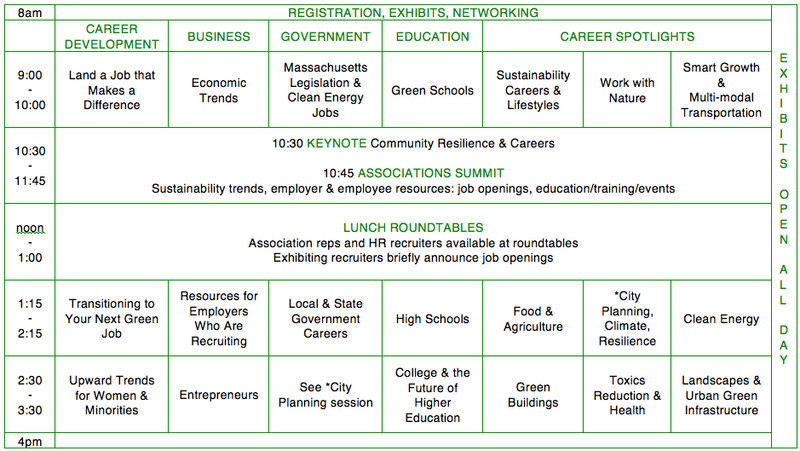 Discover a wide variety of job openings, education/training, events, and sustainability trends. Tables will have signs for each association rep at the summit. Exhibitors who are recruiting will announce job openings and be available at roundtables, too. Networking and business socializing is encouraged. Prepare for the next step in your green career path by clarifying your goals, making connections and gaining practical experience and skills relevant to your field of interest. Access the talent pool. Recruit, train, and retain the talent you need! Get connected to resources. Stay on top of trends. Be the change! Make an impact in your community and your state government. Decision-makers and team players help make sustainability a reality. 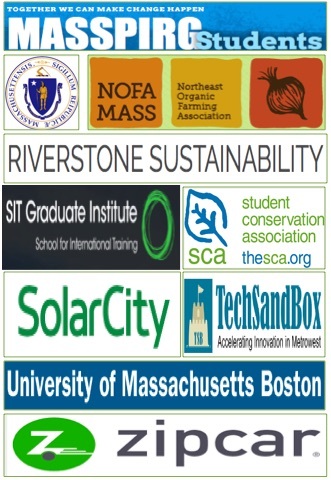 Sustainability education in high schools prepares students for future careers. Schools are vital learning labs that can provide much needed experience. Development of a healthier, local food system is showing promise and creating career opportunities. A new wave of climate-ready planning, including the 2017 International Summit in Boston, Climate Ready Boston, and Boston’s new Resilience Strategy will spur climate-related jobs. What can we expect? We are entering a new age of solar, energy storage, microgrids, and novel technologies that are ‘off the grid’. Women and minorities are rising in leadership roles across the board. Learning to ask for fair pay and social equity is part of the process. Confronting clean energy, food, and sustainability challenges are some of the areas creating an exciting world of opportunities for enterprising people. Sustainability, affordability, experiential learning, online education, flexible options, job placement – these are some of the things today’s students are looking for. The construction industry is being transformed by several initiatives that support careers in clean energy and sustainability. While building codes call for better energy efficiency and net zero energy buildings are being built, government buildings continue to meet higher standards at the state and local levels. There are many opportunities worth exploring to ensure we all have an equal right and access to a healthy and safe environment. Clark University provided 50 FREE copies of The Sixth Extinction (2015 Pulitzer Prize winner) at their exhibit table, and 20 books were raffled away for free at the conference registration table. Adriel Bencosme provided free portraits. Providing best practices and resources for career development and sustainable development. All produce was local bought from Pioneer Valley Co-op which is sourced by about 60-70% western Mass farms and a few in CT.
Cheeses were from Greensborogh VT, Cabot Cheese in VT, and Luitzin in North Haven CT.
Fruit was from Tougas Farm in Northboro, MA. Fair Trade organic coffee provided. Unserved food was donated to local shelter. No bottled water. Tap water was served in pitchers. Limited handout requirements honored our environmental mission. No presenter handouts were permitted. Presentations were posted on the website after the conference. Exhibitor materials included reusable posters & banners. Exhibitor handouts, if any, were made from sustainable materials. No paper pads, pens, etc. were distributed by the conference center. Our conference guide was limited to one page, double-sided printed on recycled/FSC paper. The beautiful, historic train station is less than three walkable blocks from the conference. City bus service was available. 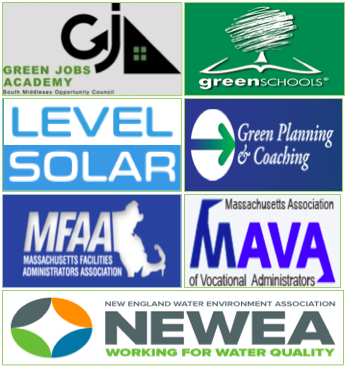 The carbon offset for all building energy and transportation to and from both our annual conferences is a donation to a Massachusetts environmental organization. 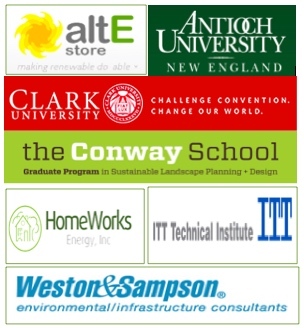 Former recipients: Climate Action NOW, Green Marlborough, Home Energy Efficiency Team, Live Cooler, Mass Climate Action Network, and Toxics Action Center. Ticket fee ($40-$95) covered exhibitors, presentations/sessions, coaching, roundtable discussions, light breakfast and lunch, and book raffle. Group discounts were available.